It’s important to leave enough space between trees in the canopy layer, so that there’s enough light coming through to the plants below. Otherwise, you’ll end up with weak and spindly specimens! 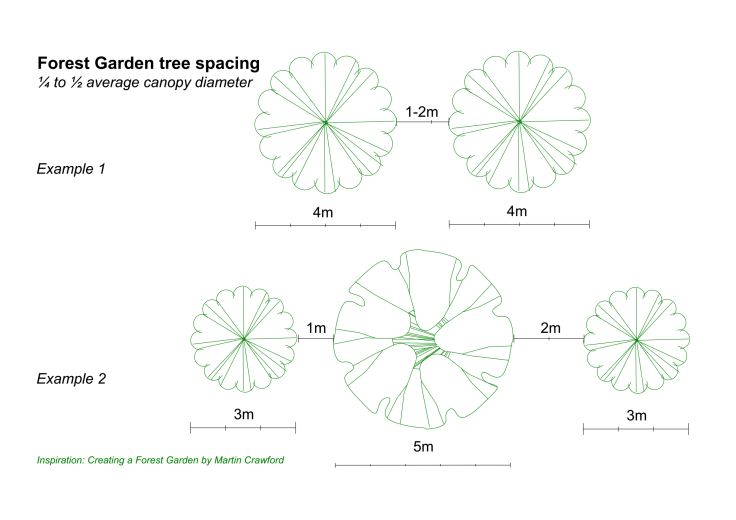 Martin Crawford in Creating a Forest Garden recommends a spacing of about ¼ to ½ of the average tree canopy diameter (pp149). This is amply demonstrated in the illustration what I created. If you’re interested, you can download the PDF or the original CAD file. Croeso 🙂.